And it's been hot enough for a dip. 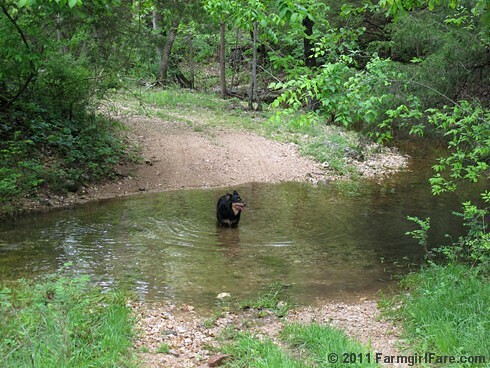 © FarmgirlFare.com, where Lucky Buddy Bear looks a whole lot smaller when he's soaking wet. I hope all is well on the farm and your creek isn't getting "full" again. The weather is horrible and doesn't look good for many days. Be well!!! BEEEAAAAR!!! Keep cool there, buddy. Bear looks happy in that creek.